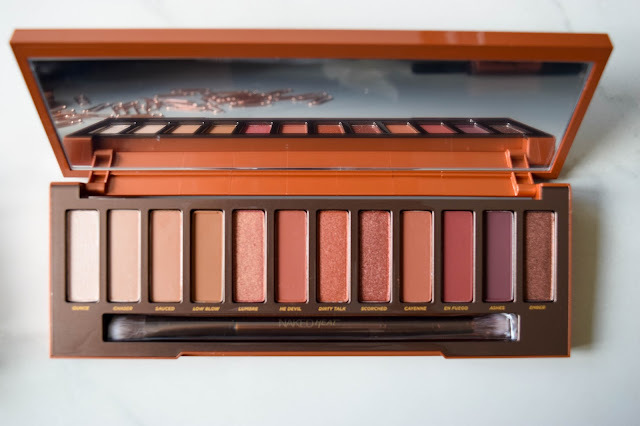 I have never been so excited about a palette in my life. 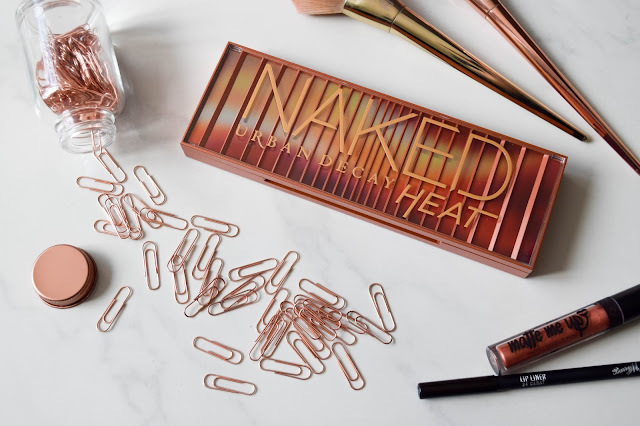 I adore reds, bronze and copper colours in my makeup and when I saw Urban Decay were releasing the Naked Heat Palette I knew I had to have it. So with a gift card I had from John Lewis I managed to get my hands on one. I'm really excited to share this with you and though you might have read about 40 reviews from other bloggers and youtubers, I wanted to review it for myself and share what I thought with you. First of all, the packaging is beautiful. It radiates what the palette is all about. Warmth, autumnal tones with touches of shimmery gold. The packaging is quite heavy, but I like that in a palette. It feels sturdy, it opens and closes with help from a magnetic clasp and it overall feels of high quality. The colours of the packaging represent well what to expect inside too. 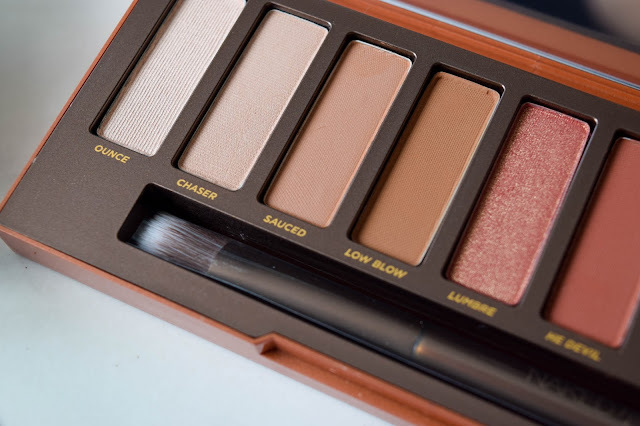 Inside the palette you get 12 gorgeous shades ranging from a a warm ivory to a dark red-bronze. I would say that just 5 of the shades are shimmer shades with the other 7 being matte. The names of the colours are great too, they all relate to warm or spicy things such as Cayenne, Scorched and He Devil. It's a clever play on words which I will always enjoy! You also get a lovely big mirror to help you do makeup on the go and a double ended brush. One end being a blending brush and the other a detailed crease brush. I was so excited when I first saw these colours. They are gorgeous and I cannot tell you how much I've been enjoying using these recently. I already have my favourites but I have a couple I'm not sure about still either. First up my favourite colours right now are Ounce, Low Blow, Lumbre and He Devil. They're the ones I find myself gravitating towards more for a lighter warm look. 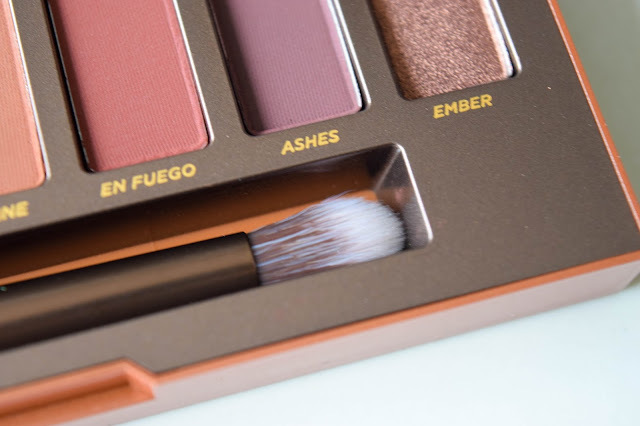 But when I want a darker and more exciting look I really like going to En Fuego and Ember to really darken it up and add some smokiness to it. 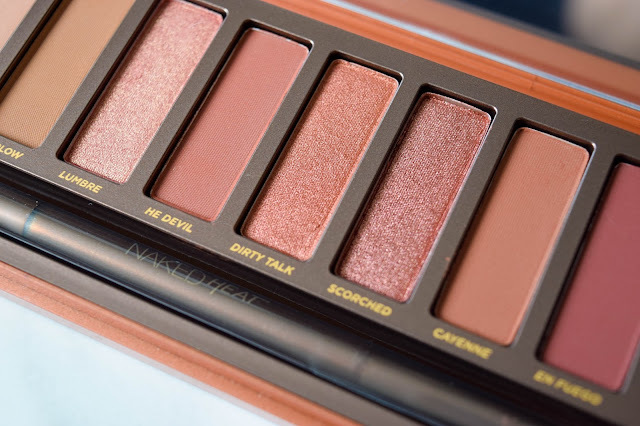 I really like both the mattes and the shimmers equally as much in this palette but I've always been a fan of shimmers more. 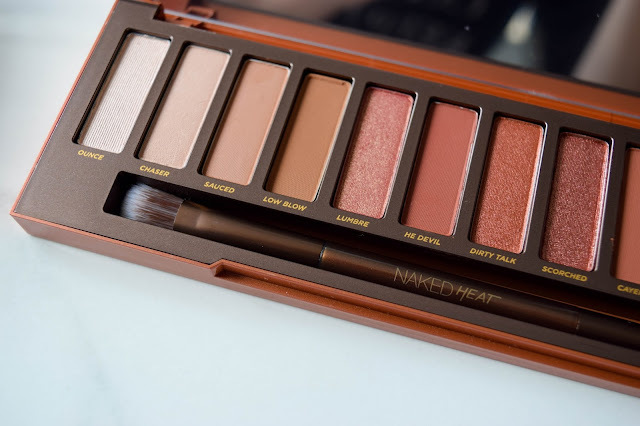 This time, I think I prefer the mattes in this palette. I feel they're really well pigmented and nice to blend too. As for my least favourites, I'm still struggling to love Ashes not because of the colour but more because of the way it blends. I really love this colour and it is an amazing warm purple that works really well here but I find it blends into a dark red and doesn't keep it's purple tones well. It's weird because I really want this to work and I love the colour but I can't seem to blend it nicely and keep it's purple-ness. Am I doing something wrong? I hope so because I so want this colour to work in a look. I also find the shimmers Lumbre, Dirty Talk and Scorched are really similar. It's hard to differentiate which one is which in a makeup look as I've tried to do like a smokey shimmer look but I'm finding they're too similar. I'm hoping again it's just something I'm doing wrong and I can overcome this. Nevertheless the shimmers are beautiful and I will continue using them in looks. Here are the first swatches I took. Please bear in mind I was worried about ruining the palette and cautious about putting my fingers in the palette so they're not amazing swatches. 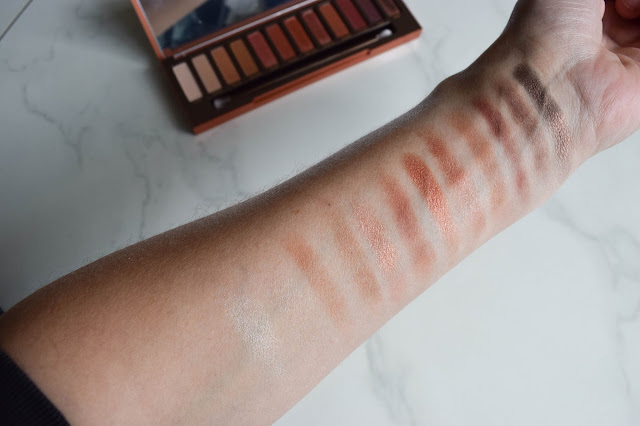 I swatched the palette from left to right on my arm in order of them in the palette. I would say Chaser looks much better on he eye and you can probably see what I mean about Ashes here too. I'm quite liking the brush in this palette. 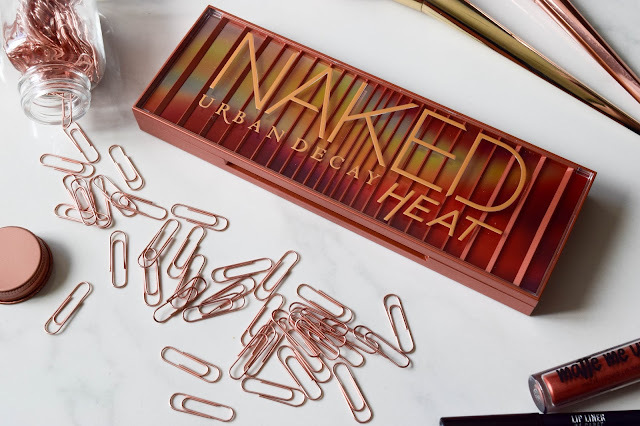 I always love that Urban decay put a double ended brush in their palettes. Personally I've always loved their blending brush and it is great for blending but I've been using this end (left) as a regular shadow brush for packing on colour. The detailed crease brush though is very lovely! 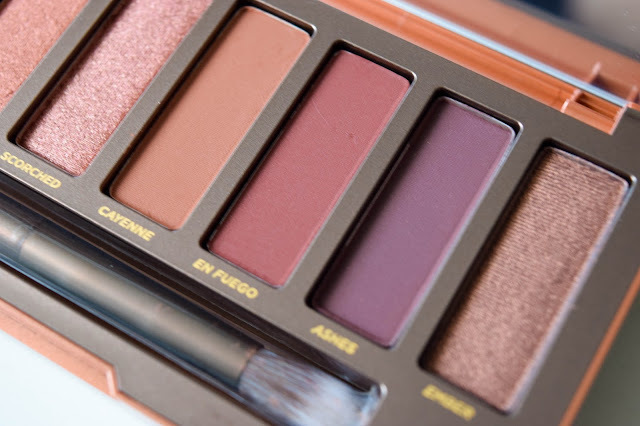 I adore how it works to do as it says and is great for blending in darker colours into the crease and creating a smokey look. That said I much prefer using some of my other brushes along side these two including the Real Techniques shadow base brush and blending brush which I use best clean to blend out colours from the crease, out. The question is always at the end of one of these posts, would I recommend it and of course I am going to recommend this. The colours are beautiful and it adds a powerful warmth to a makeup look. I am going to be sharing my favourite looks on the blog soon, I'm just thinking about how I'm going to create that post at the moment. Is that something you think you might like to see? I just feel like I want to show how diverse this palette is considering how similar some of the colours are. Anyway, I know I'm late to the bandwagon but I wanted to be trying it for a couple of weeks before reviewing it properly so I hope you enjoyed reading what I had to say! I bought a dupe of this and definitely wont be doing that again. 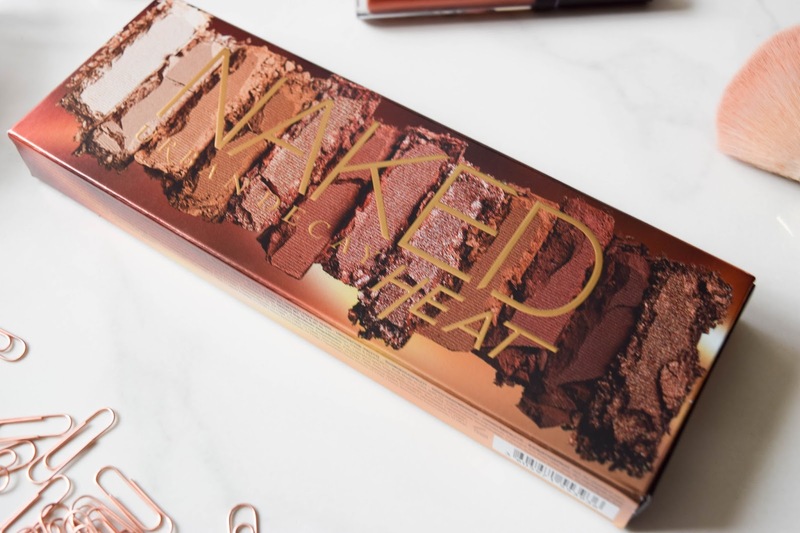 This is the first review I've read for this palette but it's my kind of palette!